The Cleveland Museum of Art featured this image on a large wall banner for its 2015 installation of Senufo: Art and Identity in West Africa. Ceramic vessels in the exhibition stood in front of the banner. A small caption acknowledged me as the photographer’s creator, located the image to the town of Kenga, Burkina Faso, and dated the photograph to 29 January 2007. 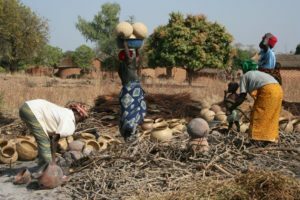 Interviews with potters in western Burkina Faso in 2006 and 2007 led me to several towns near the Malian border, including Kawara [Kanvara], Kenga, and Pélignan (see also Roy 2013). 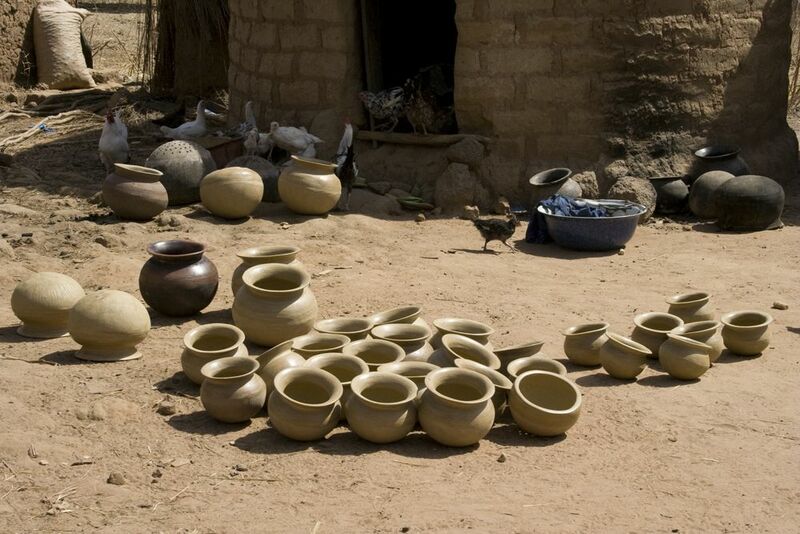 In Kenga, I photographed this raw ware drying in the sun before its firing. American art historian Barbara Frank had commissioned Dahaba Ouattara and me to conduct the interviews as part of her ongoing study of pottery in the three-corner region, an area defined by the present-day borders of Burkina Faso, Côte d’Ivoire, and Mali (Frank 2007: 39, n2; see also Frank 1994, 1998, 2000, 2007). Frank also encouraged us to attend a pottery firing. During our visit to Kenga in the afternoon of 29 January 2007, Ouattara and I watched a firing. 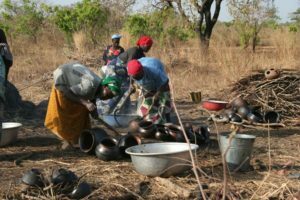 When we arrived in the town, Kenga-based potter Diata Diabate met us as she and a group of about ten women prepared for the event. Some women carried hay and wood to the firing pit. Other women collected and pounded fruits for a post-firing water bath for the vessels. The women also burnished some of their raw ware. 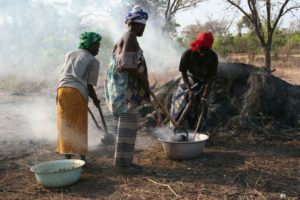 As the women gathered with their vessels at the firing pit, several women covered the floor of the pit with a circle of wood. They placed one previously fired vessel on top of another previously fired vessel in the center of the pit. 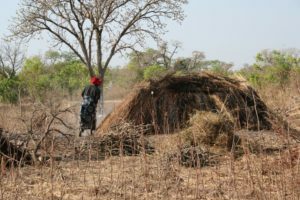 The women then arranged their unfired vessels in a mound around the two previously fired vessels, and they covered the mound with hay. A woman sprinkled water over the hay before the women ignited it. 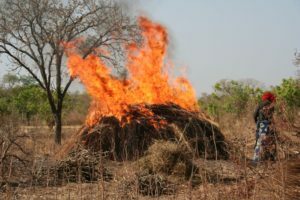 As the fire progressed, women added fresh hay and additional flames to the mound. At a certain point, the women started to use long hooks to pull pots from the pit. They plunged the hot pots into piles of grain or fruit-infused water baths before placing the fired vessels on the ground or on piles of wood to dry. 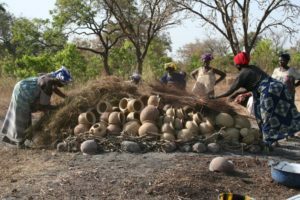 According to Diabate, the Kenga potters planned to sell their finished wares in nearby markets, including the market in the nearby town of Ouéléni. My research experience informs my evaluation of the location associated with this photograph. Searches for “Kenga” in the US National Geospatial-Intelligence Agency’s GEOnet Names Search database have to date yielded no results. However, when I visited the town on 8 March 2006, I noted that the motorcycle’s odometer indicated the town was located about six kilometers from Ouéléni. When I visited the town again on 29 January 2007, I used a global positioning system (GPS) device to record coordinates. Based on this data and my memory of the town’s location, I identified the town in Google Earth in June 2016. Frank, Barbara E. “More than Wives and Mothers: The Artistry of Mande Potters.” African Arts 27, 4 (1994): 26-27, 93-94. Frank, Barbara E. Mande Potters & Leatherworkers: Art and Heritage in West Africa. Washington DC: Smithsonian Institution Press, 1998. Frank, Barbara E. “Recovering the Past: The Place of Pots and Potters in Mande Art History.” Iowa Studies in African Art 4 (2000): 28-52. Frank, Barbara E. “Marks of Identity: Potters of the Folona (Mali) and their ‘Mothers’.” African Arts 40, 1 (2007): 30-41. Roy, Christopher. “Pottery in Africa: Forming and Firing.” YouTube video, 1:04:53, from a DVD produced in 2003. Posted by Christopher Roy, 13 April 2013, https://www.youtube.com/watch?v=52HKSwkI1hs. Gagliardi, Susan Elizabeth. “Kenga: Raw Ware Drying before Its Firing, 29 January 2007.” In Mapping Senufo. Atlanta: Emory Center for Digital Scholarship, 2015–. http://www.mappingsenufo.org/archives/977 (21 July 2016), accessed 22 April 2019.